With the implementation of latest technology and advanced testing equipment, we offer Sheet Metal Design services. Our adept technicians make use of innovative ideas to offer prototyping solutions, which prove to be value based product designs for our clients. The cutting edge modelling tools help in rendering services that can be availed at industry leading rates. The modulo range of Fabricated Modular Enclosure System caters to the ever growing demand for highly flexible, aesthetically pleasing & cost-effective, off-the shelf enclosures solutions. The range is the distillation of years to field research & customer interaction, thereby offering you a product that caters to your every requirement. The modulo range being highly flexible caters to a variety of applications like lighting distribution boards, power distribution boards, metering boards, motor control centres, power control centres, drive ET PLC enclosures, control desks, control consoles etc. The enclosures are highly customizable ET can be set-up for a variety of applications. The modularity of the range extends you the flexibility of mixing ET matching various styles of enclosures within a single panel board. The modulo range of enclosures follow a common design thread, with many parts that have multiple applications, thereby reducing the inventory carrying cost. The enclosures are available in single front ET space saving double front configurations. The system being modular future expansion is possible. The modulo range is designed to enable quick assembly using standard tools. Thus giving you the chance to plan your job on the go. 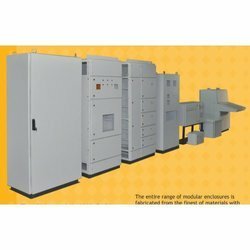 The entire range of modular enclosures is fabricated from the finest of materials with the use of the latest sheet metal fabrication design ET manufacturing tools. Thus making them the perfect blend of eye-catching aesthetics cost-effective design. The range is designed to satisfy all the stringent technical requirements ET its thereby suited to meet diverse requirements under extreme ambient site conditions. It is speciality designed to incorporate the entire range of switchgear available from Siemens, LET, Schneider, ABB, GE etc. In order to convert the existing designs of the machines and tools into aesthetic and cost effective solutions, our clients can rely on our Product Re-Engineering Services. The solutions are being offered with the incorporation of innovative technology and flexible approach. Our redesigned solutions are manufacturing innovations that increase the efficiency of the products.